Observation session 13th March | I Need my Space! Here’s an article I wrote for the Wolverhampton Astronomical Society’s on-line newsletter, about or observation session on the 13th March 2018. On the night of the 13th March however, we were much luckier weather-wise. Around 7.30 the clouds dispersed to reveal the March night sky in all its glory. To begin, club treasurer John took us on a guided whistle-stop tour of the constellations. There was Leo, rising in the south, and Gemini high, almost overhead in the south-west, with its distinctive twin stars of Castor and Pollux. Cassiopeia and Andromeda loomed above the Village Hall roof in the north-west, and Perseus to the left of Cassiopeia, trailing towards the great clusters of the Pleiades and Hyades in the west. Ursa Major stood on its ‘handle’ towards the east, and right above us, the distinct constellation of Auriga. Its show-piece star, the bright beacon of Capella, shining steadily in the March sky. Orion towards the east was much higher placed than our previous Trysull observation session. The Orion Nebula, M42, was an obvious first stop on our cosmic journey. I used a wide-angle 32mm eyepiece on the 12” reflector for most of the night, only swapping to a higher power to split the occasional double star. Through the 32mm eyepiece, the great nebula looked fantastic! The 12” mirror revealing bright swathes and structure in the gas cloud I’d never seen before, with parts of the nebula stretching across the field of view like great misty wings. The nebulosity of M43 was easily visible too, surrounding Bond’s star, in the same field of view as the great nebula. Thanks to the long focal length of the telescope, the Trapezium of bright new stars in the centre of the nebula was easily visible. We returned to this amazing deep sky object several times during the session. With Leo rising in the west, we turned the 12-inch scope to the double star Algieba, (the bottom star of the ‘sickle’), which lies above the constellation’s brightest star, Regulus. We found this quite hard to separate in the 32mm eye-piece, but we managed to see the separation under higher power. This is a true binary, with an orbit of around 600 years. 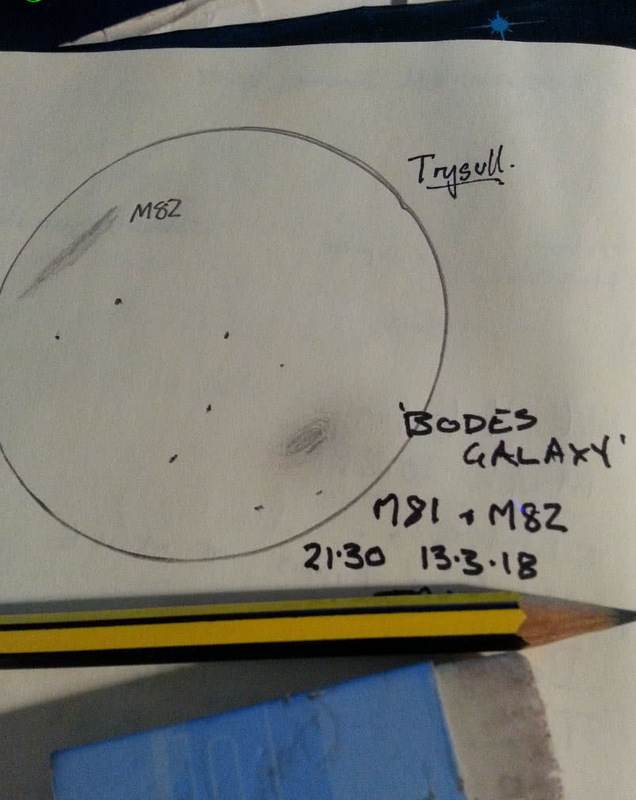 Meanwhile, Bob’s Skywatcher was aimed towards the Andromeda Galaxy (M31), which isn’t currently best placed for observation, being quite low in the northern sky, and although the centre of the great galaxy was easily identifiable, I didn’t see its companion galaxy M32. Despite this, Bob managed to get a pleasingly bright image of the galaxy with a 5 second exposure using his SLR and a T-ring. Just as he was about to further experiment with different camera settings, clouds in the north thwarted his plan. 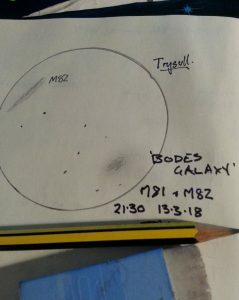 During the session, several times I turned the scope to the top right corner of Ursa Major, trying in vain to find Bode’s Galaxy (M81) and its telescopic companion, (M82). Was the slight high mist obscuring these faint, distant objects? 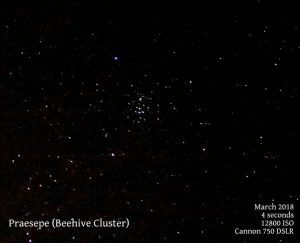 The double cluster in Perseus through the 12” reflector was stunning. The stars of both clusters (NGC 869 & 884), filling the field of view, and looking like hundreds of bright diamonds scattered on black velvet. For me, the double cluster was one of the highlights of the night, and really brought home the tremendous light-gathering capacity of the 12” mirror. I’d been looking at the same object only a few days prior with a 4” mirror, and although always pleasing, there’s simply no comparison with the larger mirror. I’d urge all members with an interest in practical astronomy to try and get a look at this object through the society’s Tom Collier scope. Being circumpolar (viewable all year), we should be able to get a viewing of this at every observing session. Halfway through our session, Nina and Glenys once again joined us, fresh from their yoga class in the village hall. They enjoyed views of the great nebula in Orion, and the Double Cluster in Perseus, amongst other objects. “Who cannot be amazed, when you look up in wonder”, Nina said in a message to me the next day. Indeed! Keeping within the zodiacal constellations, the star cluster of M35 in Gemini revealed a beautiful myriad of stars which looked like a nebulous blob in the viewfinder, but all the stars were easily resolved by the 12” mirror. 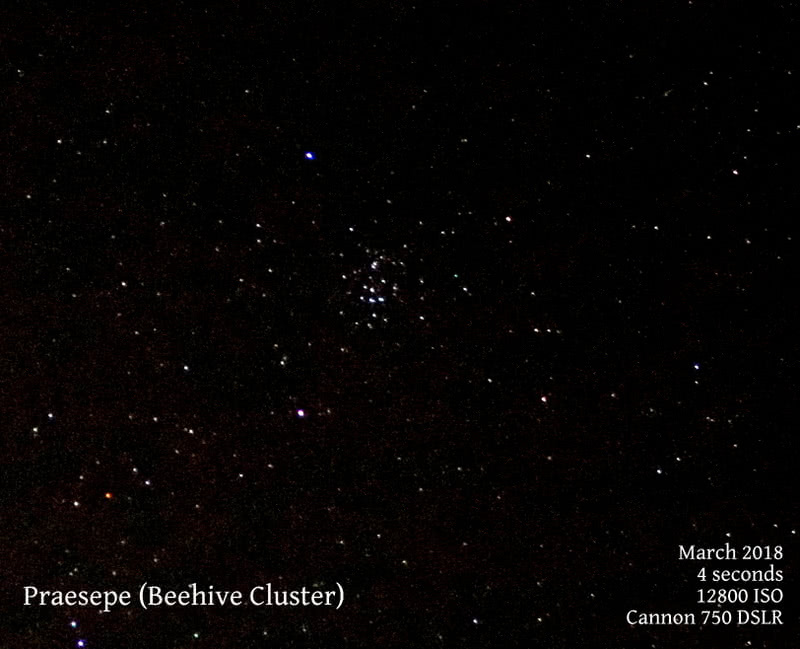 It certainly was shaping up to be an evening of beautiful open clusters! Auriga loomed overhead, (I always think it looks like a ‘squashed house’ in shape). We took in a very pleasing view of one of the three well-known open clusters, which I suspect was M38. Never having used a finder-scope with a 45 degree angle on before, I wasn’t too confident of my navigation this evening. There’s an asterism in Auriga that is useful for finding the clusters, and judging by the cluster’s proximity to it, I’ll suggest we saw M38, but I’ve added a ‘?’ next to the number in my observation book. The Village Hall was open, so we had access to the toilets, and tea, coffee and biscuits, and a heater if needed, but it was surprisingly mild outside, I thought. 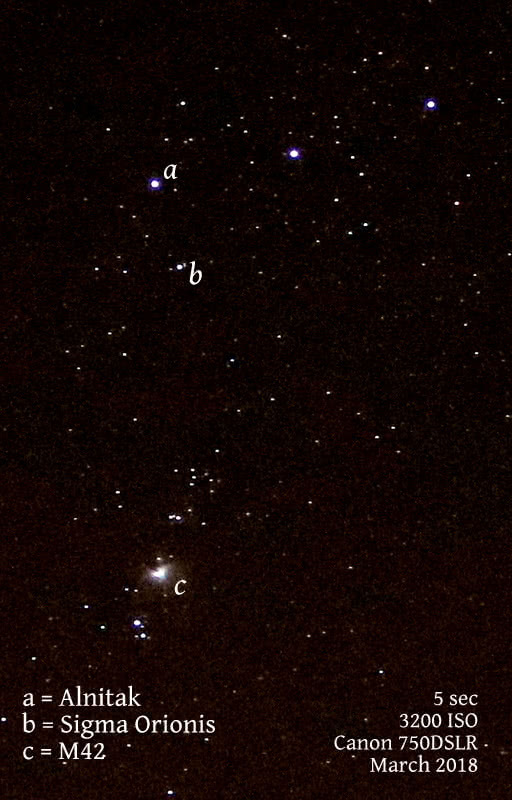 With the bright star Sirius pretty much as high as it gets at our altitude, (and encouraged by Steve Wooton’s recent talk on the Canis Major constellation at a recent Highfields meeting), we were pleased to easily find the ‘Little Beehive’ cluster (M41), just underneath Sirius. We enjoyed a view of a very pretty, loose cluster of relatively bright stars, its low elevation hiding many fainter stars in the suburban haze I suspect. One of the evening’s failures was M1, the Crab Nebula, a supernova remnant in Taurus. I scanned the area around the Taurus star Tianguan for quite a while, (the object is just above this star), but I suspect the 8.4 magnitude nebula was either lost to the thin hazy clouds, or I was unable to discern the object from the stars. It’s visually quite small if I remember correctly. A far easier target was Mizar and Alcor, the double/triple star that is the middle star in the handle of the Plough. 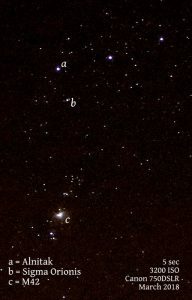 Alcor and Mizar can be seen as a ‘double’ star with a keen naked eye, but the telescope reveals Mizar’s true binary double, and the three stars were easily visible though the eyepiece. As the sky got increasingly hazier, around 9.30, the pressure was on to finally find M81 and M82. That portion of Ursa Major was almost overhead by this time, and all but the brightest stars were invisible due to the thickening cloud. But our patience paid off when we eventually found the two galaxies, both visible in the same field of view. As we took turns at the eyepiece, a few of us strained to see the two faint deep-sky objects, but they were made more apparent by ‘tapping’ the telescope, which can draw the eye’s attention to fainter objects as they wobble in the field of view, (I’ve used this method on some very faint NGC galaxies when observing from dark sky sites in Shropshire). I made a rough sketch in my observation book from memory before I drove home (picture 4). M81 is 7.9 magnitude, with M82 quite fainter, at 8.8. Both galaxies are quite accessible through 10×50 bins under rural dark skies, but with thin cloud and a semi-urban sky, I think the 12” mirror did very well in capturing the faint light from these galaxies. 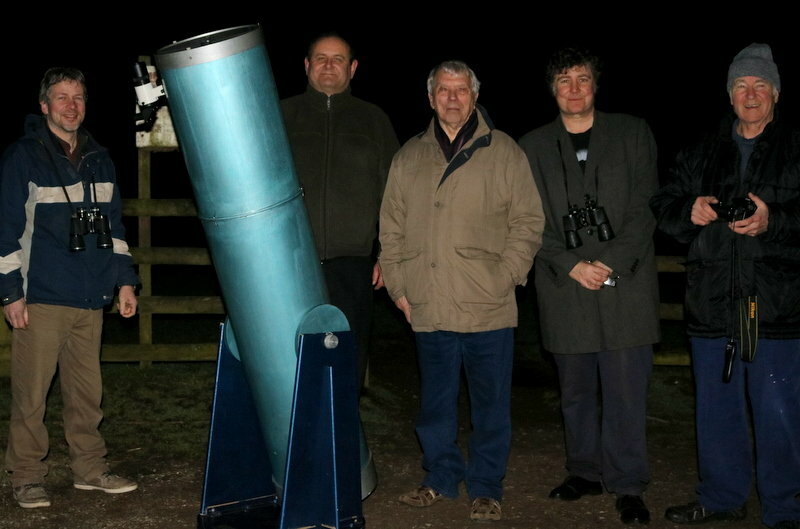 By now, there were only five of us left, and we took a quick group photo around the Tom Collier scope, and all agreed we’d done some useful observing and had packed quite a lot into the hour and a half time window that the weather allowed us.